Is there anything different in the pretreatment/wash system for powder coatings vs. liquid paints? What is the best cleaner for powder coating? What different technologies are available for cleaners? How do I tell if my parts are clean? What is phosphating and why do I need it? What pretreatment is best for my application? Recently, I have not been achieving my performance requirements (Salt Spray). Where do I start looking? What do I need to know about waste from pretreatment processes? Why doesn't the gun control show any Kv reading? Why does powder surge from the gun? Why does the powder drift out of the openings of the spray booth? Why do I need to add virgin powder to my reclaim? What does proper fluidization look like? Why won't the powder stick to the part? What is the difference between Style and Zone gun triggering? What is an acceptable ground for maximum transfer efficiency? What is the best way to store my powder? How long can powder be stored? How do I get good powder coverage into Faraday areas? How do you know if powder is cured? Does particle size make a difference in powder coating? Are there powders for interior or exterior use? How do I check for proper adhesion, and intercoat adhesion? How do I select the proper coating for my application? What is the difference between oven cycle time and dwell time? How clean should my compressed air be? How should I filter my compressed air? How should I maintain my compressed air filters and air dryer? How close should I install my air dryer to the powder booth? Can my environmental room be too cold? How often should I clean my gun? Pump? How often should I change my powder hose? How should I properly ground my booth? How should I handle precoated or recoated parts? Powder coatings can provide improved performance over liquids when applied to a properly pretreated part. Solvent-borne paints are usually more forgiving of organic soils left on the work piece by sub-par cleaning. Because powder does not have solvents, you need to make sure the washer does a good cleaning job. This is just good operational practice and is not an unusual requirement. Iron phosphate is the most frequently encountered pretreatment used with powder coatings. However, if the highest level of performance is required, zinc phosphate will work admirably with powder as well. There is no stock answer for this question. Many factors go into deciding which cleaner is the best for your application. Base metal of the work piece, soil being removed, bath temperature, contact time, oil removal capabilities, environmental considerations, etc. must be taken into account when deciding. The bottom line is that you need to get your parts clean, safely, so the steps following in the pretreatment process will function properly. Check with your pretreatment supplier to determine your best course of action. There are powdered and liquid cleaners. There are acid cleaners that may be best for inorganic (metallic) soils. Alkaline cleaners are often recommended for organic soils. Neutral cleaners may be used to remove soils on substrates that react with strong acids or alkalis (aluminum or zinc). Oil splitting cleaners may be desirable where high levels of oil build quickly in the process bath. Work with your pretreatment supplier to determine which cleaners are best for your application. There are many tests to determine cleanliness. The most widely used is the "water break free" test. This test is a visual observation of whether water fully sheets over the clean part or draws away from portions of the surface (like water on a waxed car). Other tests may include wiping with a white cloth, alcohol drop tests, or other more sophisticated laboratory testing like coulometry (organic soil is burned off the substrate and measured). Again, your pretreatment supplier can assist with evaluating your part cleanliness. The generic term "phosphating" is a process where an acid attacks the metal of the work piece and re-deposits a material that is a combination of the metal substrate (and other metals - like zinc) along with phosphate. This process creates a surface that is tightly adherent to the base metal, has more surface area, provides improved corrosion inhibition, and helps the powder coating stick better. It provides a good coating base so the finished part has increased usable life. Iron phosphate is the most frequently used pretreatment for powder coating. It can be used with almost any substrate. Powder coatings will often give improved performance compared to liquid paint over the same pretreatment. For "high end" applications, zinc phosphate may be the pretreatment of choice. However, this process is more costly to operate, uses heavy metals, and can produce considerable sludge. The washer typically requires added stages versus an iron phosphate washer. If you cannot achieve the desired performance with iron phosphate, zinc phosphate or an improved paint system may be your only choice. Troubleshooting a process line can be complicated. First determine if anything has changed in the incoming work piece. This would include the metal itself as well as the incoming soil. Then determine if anything has changed in the wash process. Concentrate heavily on the cleaning stage. Many of the downstream problems can be traced back to the efficiency of cleaning. Look for the proper concentrations, nozzle performance or alignment, temperatures, and bath cleanliness. You can often see visual signs of cleaning efficiency at the exit of the rinse stage following the cleaner. If cleaning is good, verify that the pretreatment coating is still up to snuff. Often there are visual changes if the pretreatment varies. This may show up as a color difference, blotchy appearance, etc. Keep in mind that the variation of the pretreatment may be caused by poor cleaning. Lastly, check the quality of the rinse water. The coating is only as good as the last liquid the part sees. Contaminated rinses can leave salty deposits that will dramatically reduce Salt Spray performance and may also affect coating adhesion. Generally, oil and grease, metals (zinc from the substrate, or the zinc phosphate bath), and pH are the concerns from an environmental reporting standpoint. However, sludge or contaminant buildup in the cleaner and phosphate stages may force regular cleanout of these stages. The waste treatment process is usually a simple pH adjustment and flocculation. However, consult your treatment chemical or waste equipment supplier to assure acceptable results. Loss of power to the unit. Not enough supplemental or forward air to keep the powder in suspension while moving through the powder hose. Improper seal between the powder injector and the lift tube in the gun feed hopper. Possible blockage in the powder path from buildup or impact fusion. Check the gun tube, powder hose, and pump insert. Not enough containment air flowing through the booth and recovery system. Cartridge filters not receiving adequate cleaning. Increase pulse down air pressure or volume. Cartridge filters nearing the end of their expected life. Final filters becoming clogged. Note that final filter clogging may be related to poor upstream seals or leakage of powder in the recovery. As virgin powder is applied, the larger particles more readily stick to the part. This leaves the over sprayed powder with a lower average particle size. As this occurs during each cycle through the system, the recovered material may become laden with fine particles. Eventually, the reclaimed material will be nearly unmanageable in both fluidization and application. Friction may cause powder particles to fuse along the walls of the powder hose and other components in the powder delivery path. Impact fusion is the combining of these powder particles to form a solid mass during the delivery and application process. The fluidized material should take on fluid-like characteristics. It should have an appearance similar to that of water simmering on low heat. The material should not be boiling hard. Electrode-rinsing air is a feature that provides circumferential air that keeps the electrode free of powder build-up to ensure consistent maximum charging efficiency of the gun. Gun or control failure resulting in a loss of Kv at the gun. Inadequately grounded parts due to dirty hangers or poor conveyor grounding. Electrical contact failure to the electrode or excessive powder buildup resulting in a loss of charge potential. Zone triggering typically relates to the guns automatically spraying when a photo eye or a light curtain is used to determine the vertical zone is broken or that a part is present in that particular zone (the part opening may be broken into multiple zones). Style triggering generally uses multiple means of sensing in order to identify the part type or style. The guns then trigger on or off based on a recipe or pre-set parameters pre-programmed by the user. The fundamental difference between zone and style is that zone formats do not care what the part is, since they paint by size. Style must recognize each part or family in order to know how to paint. Uncoated metal parts, clean hangers, and clean conveyors have very little resistance to ground and are excellent electrical conductors. What can degrade this ideal path to ground is powder build-up on the contact points of the hangers or conveyor. Also the conveyor may have swivels or indexing assemblies that, when contaminated, can impede grounding. All of these in total must not exceed one megohm resistance to ground. A Megger (an ohm-meter that has a megohm scale), which has a power source of 500 volts or higher, is typically used to measure continuity to ground. Practically all powder coatings are not hazardous waste by definition of the Resources Conservation and Recovery Act regulations (RCRA). Disposal methods for waste powder are the same as for non-hazardous wastes, in most states. However, there may be some exceptions and your powder supplier should be contacted regarding proper disposal. Always renew disposal needs with the local authority having jurisdiction over your facility location. Powder storage for many months is often normal practice. Ideally, powder should be stored in the optimum conditions of less than 80°F and approximately 50 - 60% relative humidity. Under these conditions most powder should be readily usable for at least a year. Avoid placing powder inventory in close proximity to any heat source such as an oven, washer, furnace, space heater, etc. Powder packaging is designed to protect the contents from compression that can result in lumps that are not readily broken. Do not stack packages that are broken or collapsed. Some powders with special appearance, performance, or cure properties may have greater sensitivity to storage conditions, and should receive greater attention when stored to ensure the desired results. How do I get good powder coverage into Faraday areas? Faraday cage effect defines a condition that occurs when parts are coated that have recesses, inside corners, channels, or protrusions on their surfaces. The Faraday cage is the area of the part where the external electrical field does not penetrate. Powder coating of recessed areas is often complicated. For the successful coating of Faraday areas, the following conditions must be met: powder has to be well charged, airflow must be sufficient to deliver the powder inside a recess but not excessive to preclude powder deposition, and the external electric field must be controlled to reduce the "push" for powder particles to deposit on the edges of a Faraday cage. Because most Faraday areas involve some type of "pocket " areas, it is important that the method for directing the powder flow in allows for displacement of the air in the pocket area to allow penetration. There are two conditions that must be met to achieve proper cure of a powder coating. The first is temperature, referred to as metal temperature, and the second is time. The time/temperature requirements of a particular powder material must be achieved to obtain a full cure. A cured thermoset powder coating will not re-melt upon further heating. To ensure proper time and temperature it is often best to test using a Datapaq or similar device to provide actual performance data. Particle size plays an important role in the application process. Size distribution affects many other properties critical to consistent performance including: fluidization, powder transport in hoses, uniform cloud density, powder movement in air, electrostatic charging, deposition and build rate, transfer efficiency, Faraday cage penetration, wraparound, and film smoothness. Size distribution produced by the powder manufacturer must take the coating system design and anticipated changes into account to provide a suitable product. Final cured surface appearance may also be affected by the particle size distribution and flow rate. One of the most important considerations in defining the end use performance is weatherability. Outdoor exposure results in absorption of ultraviolet energy. This energy can attack the organic binder and result in gloss loss and color change. Due to a tendency to chalk, epoxies and epoxy containing hybrids are generally not recommended for outdoor use when aesthetics is a primary concern. Polyesters and acrylics on the other hand provide excellent UV light stability and typically find use in architectural, automotive, lawn and garden as well as outdoor furniture markets. Adhesion is very dependent on the cleanliness of the substrate, the appropriate selection and maintenance of pretreatment, and the proper melt and cure of the powder coating. Adhesion may be tested by several different methods. A commonly used technique is the cross hatch and tape method. In this method, crossed cuts are made through the coating. Adhesive tape is then applied to the cut coating and then removed quickly. The coating adhesion is then measured by its ability to remain on the substrate and to not be removed by the tape. 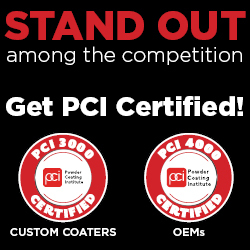 Powder coatings vary in their ability to provide intercoat adhesion when recoated. Epoxy powders tend to be harder and more prone to intercoat adhesion problems, particularly if they have been over baked. On the other hand, polyesters and epoxy-polyester hybrids usually recoat well. Chemistry for recoat is also important and should be tested with your powder supplier. The selection of a coating should be undertaken as a cooperative effort between the end user and the powder formulator (supplier). In developing a coating for a particular application, the formulator must consider a number of factors. As an example, if the coating requires high pencil hardness and mar resistance along with weatherability, then flexibility may be reduced. If superior chemical resistance is required, then weatherability and over bake yellowing resistance can be compromised. Other considerations may be cure time and temperature, substrate type and treatment, and application method. Only when all requirements of a particular application are considered can a formulator recommend the proper coating type. The oven cycle time is comprised of the bring-up time plus the dwell time for a proper powder cure. The bring-up time is the time required to attain the desired substrate cure temperature of the part. The dwell time is the time required to hold the substrate at cure temperature. These times and temperatures are available from the cure schedule for the powder coating. In some applications, shorter oven cycle times are possible by rapid heating of the substrate to a higher cure temperature for a shorter dwell time. Next to proper grounding, clean compressed air is the most important thing. Oil and water do not mix with powder. In a powder system, air plays a big role. Powder is fluidized with air, pumped to the guns with air, and the cartridge filters are back-pulsed with air. The equipment and powder manufacturer should be consulted regarding the air quality for optimal performance. In general, a minimum 35°F dew point and less than 0.1 ppm contaminate or oil is a good starting point. Always consult your compressor manufacturer. You should have good oil and water extractors along with a refrigerant or a desiccant dryer system. With either system type selection, an oil coalescing filter with automatic drain and particulate filter are recommended. Drain extractors daily and check internal filters monthly. Replace desiccant beads when indicated and have your refrigerant dryers serviced once a year. Depending on size and volume, an automatic indicator may be used to ensure proper performance. Again, always consult the manufacturer's manual. Place the dryer as close to the room as possible, but not in the powder room. This will give the compressed air less of a chance to form moisture in the pipe as it travels to the booth. Can my environmental room be too cold? Yes. If the room is too cold, condensation can form on supply ducts and vents, then drip on parts or the powder booth. This is air that is supplied at the nozzle to twist the pattern and close the donut hole pattern that is common with diffuser or round-type nozzles. This can provide better direct powder penetration into corners. Additional air will increase the pattern size, potentially reducing the need to change tips. Guns should be cleaned after each color change. At the end of the day, you should purge the gun, pump, and hose to prevent moisture from settling in the powder and clogging things up for the next use. Depending on the volume of powder sprayed and time between color changes, deep cleaning and worn part replacement should be reviewed weekly. It is recommended that you change your powder hose at least once a year depending on wear caused by the powder or if you are having contamination problems. Frequently inspect for cracking or impact fusion that may shorten the hose life. Drive the rod vertically into the ground and attach a grounding strap directly to the booth. Contact your local electrical contractor for a standard grounding rod, typically copper. Precoated or recoated parts may already be insulated with 1 to 2 mils of coating. Powder starts to repel itself around 4 to 5 mils. Turn down the gun voltage (Kv), by at least half, to prevent the repelling or back ionization of the new powder material. Also verify with the powder supplier to ensure proper intercoat adhesion.